Teachers reading books. Reading together helps your infant develop a love and familiarity with books. Reading aloud also helps your child's vocabulary grow as she has many chances to hear new words and sounds. An environment with quality educational materials and learning experiences that evoke and satisfy your baby's natural curiosity. Our teachers implement learning activities based on your child's developmental stage and interests. 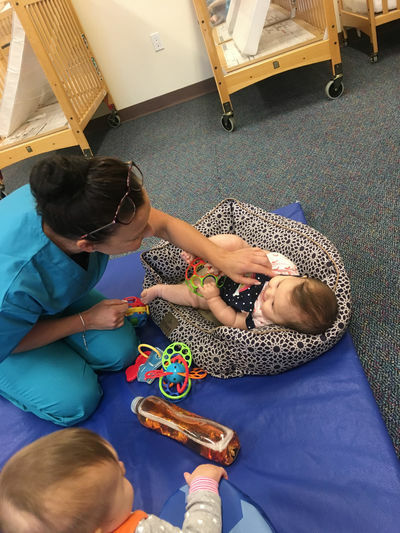 A schedule that is flexible to allow for your child's individual needs while ensuring that your infant has the opportunity to experience a wide variety of activities and stimulation throughout the day. *The Staff! The staff is friendly, inviting and engaged with children during pick-up and drop-off times. *The Physical Space. 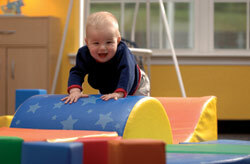 There is plenty of room for exploration, full with educational toys and sensory-based homemade toys. *Art! The infants are always busy making customized artworks. Our parents love the holiday-based art we display and send home with students! *Clean! The classroom is very well-kept and visibly clean. *Interaction! The teachers with the infants, but encourage the infants to interact with one another! *Photographs! The parents love seeing the photos of children inside, outside and on their PreciouStatus application. A research-based developmental program developed specifically for our Infants and Young Learners. 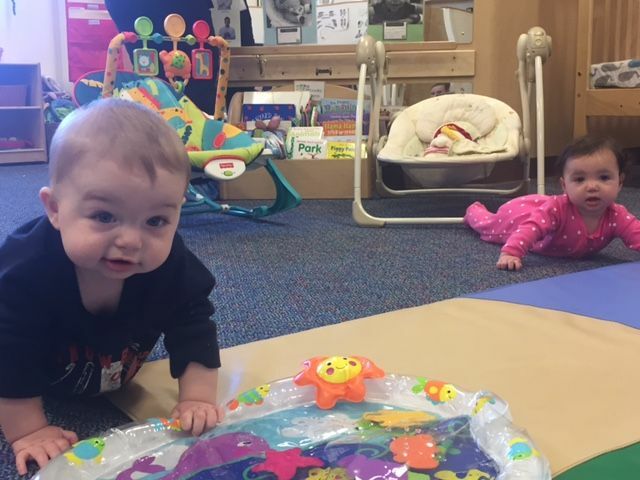 Unlike other programs, Learn from the Start focuses on key developmental milestones rather than chronological age. In doing so, unique experiences and lessons are designed around your child's needs and emerging skills. Each individual and small group experience will stimulate and expose learning concepts in a fun and engaging way. Other special features of this exciting program include: - Introduction to basic sign language to give children nonverbal communication tools. - Specially designed classroom areas for focus on language, movement and sensory development: Exploration Area, Movement Area, Cozy Area, Diapering and Meal Time. - Progress monitoring and reporting so you are always up-to-date on how your child is learning and growing with us! 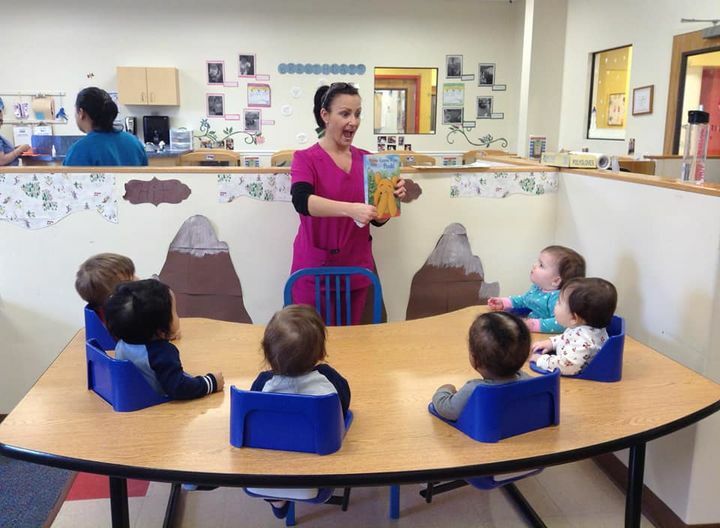 From rocking and thoughtful interaction, to naptime, singing or a reading of "Goodnight Moon," Tutor Time teachers provide just what your baby needs, all in a safe, clean and healthy environment. And it's just the beginning of our Tutor Time® LifeSmart™ curriculum.
" A very creative teacher, Ms Nardia's lesson plans are very thorough. Always nurturing, gentle and cheerful and ready for the day!" "Ms. Ashma is warm and nurturing with our babies. She responds to the needs of the babies with sensitivity and understanding." "Ms Deirdre is an exceptional experienced Infant Teacher. Her knowledge and personality is what makes her very busy classroom a successful program." "Ms Tiarah has a calm and patient approach in the classroom. Her smile is contagious, as the babies smile right back!" ASL Discoveries singing and signing with our babies.